Wayde van Niekerk is disappointed over the criticism he received in London. Photo: Antonin Thuillier/AFP. Wayde van Niekerk eased his way back into competition at the weekend. Turning out in his first official race in 18 months, after recovering from a serious knee injury, the 400m world record holder clocked 47.28 seconds to win the men’s 400m title at the Athletics Free State (AFS) provincial championships in Bloemfontein. 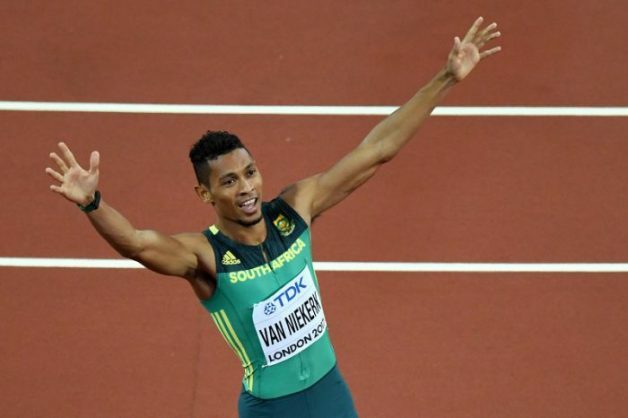 Van Niekerk, the world and Olympic champion, covered the one-lap distance 0.22 clear of 400m hurdles specialist Cornel Fredericks, who secured the silver medal. The 26-year-old sprinter had not competed since he successfully defended his 400m title and grabbed the 200m silver medal at the 2017 World Championships in London. He was sidelined after tearing the meniscus and ACL in his right knee while playing a touch rugby match in Cape Town in October 2017. Van Niekerk, who set the 400m world record of 43.03 to win gold at the 2016 Rio Olympics, had knee surgery in the United States before undergoing a lengthy rehabilitation process. Having returned to the track, the versatile speedster was expected to target his third straight global title over the one-lap distance at the World Championships in Doha later this season.